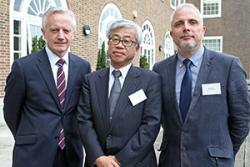 from left to right: Professor John G. Hughes (Vice-Chancellor of Bangor University), Kumiaki Moryia (Corporate Chief Engineer at Hitachi-GE Nuclear Energy Ltd.), Dr Michael Bluck, (Director of the Centre for Nuclear Engineering at Imperial College London)Hitachi-GE Nuclear Energy, Ltd. (Hitachi-GE) has signed a Memorandum of Understanding (MOU) with Imperial College London and Bangor University, enhancing its commitment to support Welsh and British expertise. Hitachi-GE will provide industry advice to Imperial and Bangor’s newly formed “Boiling Water Reactor (BWR) Research Hub and Network”, drawing on its extensive BWR experience to provide technical expertise and support. This will include part-time deployment of a researcher to Bangor, and building on the existing programme of Japanese internships for UK students. Today’s announcement was made on the back of a successful technical conference hosted by the two Universities in Bangor last week. Hitachi-GE is already supporting nuclear development in North Wales, providing the UK ABWR reactor to Horizon Nuclear Power for Wylfa Newydd, under contract to delivery team Menter Newydd. “This is about helping create a deeper and broader pool of BWR expertise here in Wales and across the UK, supporting the engineers and industry of the future. This hub provides focus and coordination to BWR research, ensuring that Wales and the UK develop real expertise in BWR technology for now, and for the future. “With development of the UKs first BWR proposed just up the road at Wylfa Newydd, this scheme helps ensure that project is a springboard to the UK becoming a world-power in its domestic expertise on BWR technology. “Imperial is proud to be working with Hitachi-GE and Bangor University to establish greater Boiling Water Reactor expertise in the UK. This scheme which will examine research needs and formulate projects to support the continued production of low carbon, baseload electricity for the UK and many other countries for decades to come. “The BWR Research Hub and Network will bring together the UK research base with Hitachi Nuclear researchers to help develop future generations of Boiling Water Reactor technology here in the UK and Wales. “We are delighted to partner with Imperial College, London with expert input from Hitachi-GE in this important development for the UK energy sector. This collaboration will enable Bangor University to help to build new academic and research capacity here in North Wales to create nuclear expertise in a new generation of scientists and engineers in the field of BWR technology.